I like to cook, shop, and go to the movies. I like traveling and museums. I'm not really the outdoorsy type unless it's a pretty garden or a chaise by the ocean. Before I could read, I would stand by my dad's typewriter and dictate stories to him. So I knew pretty young. Yes. I wrote for my high school newspaper and got some acclaim for articles there. I also won college scholarships through essay contests. I think the most encouraging thing was when I was ten, I wrote a poem about my grandfather's rose garden. Everyone made a huge deal out of it. My mom painted a mirrored frame and put the poem inside of it. It hung in their fancy guest bedroom for years. That was pretty encouraging. Procrastination. I use lockout apps to keep myself off of Facebook. In my LDS book, my main point is to show that it's fun to be mid-20s and dating in the Church, not a burden. With my non-LDS stuff, it's to show romance built on something real, not temporary lust. I always think I love print books more but then when I'm reading them I miss the features of Kindle. But when I'm on my Kindle, I miss the feeling and smell of ebooks. So I'm either impossible to please or happy either way. I'm not sure. I have nine out. Sometimes my stories connect with side characters showing up as main characters in other stories. 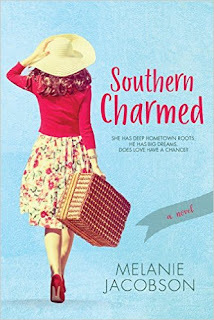 That won't happen with Southern Charmed. I told the story I wanted to tell. A lot of snippets of my husband's life show up in my books, like his background in surfing or his college band. In this book, more of my life than usual showed up because this is set in Baton Rouge, where I grew up, so I threw in favorite sites and places. I'm working on a young adult novel next about a girl who takes a road trip with her best friend and a cute boy to discover her identity.